What would I do about frost? Well, if I hadn’t protected my gunnera I would still do it but would wait until the frost had dried off. Assuming it will at some point during the day. Our frosts aren’t that hard here at the moment. On saying that, yesterday we had a little snow dusting in the morning which came to nothing. Again, if I had snow on it I would risk the plant until the crown and leaves dried out before wrapping it up for winter – assuming the snow will not last here in the UK at this time of year. The wet has been a worry for me too as we’ve had so much rain recently and as a result I have protected my gunnera slightly differently this year – hence this second posting. I wanted to protect my plant but felt that to do so when the plant itself was wet might be a mistake. I held off until it was dry – which ended up being a cold evening (two nights ago) in the dark again as last year. Worried the temp could really drop that night I went for it. Gloves on, I cut back the stems of the leaves as far down to the ground as I could and threw them aside to use later as umbrellas for this plant. With the cone shaped flower spikes exposed I was ready to protect it. I had a problem now as the leaves around the garden that I would use next were mostly wet. I gathered what dry ones I could. I expected this might be the case. I had a thought. A small packet of hay was in my shed, which came with our guinea pig hutch in the Spring, that was unopened. A bit bland perhaps for the taste buds of our guinea pigs who enjoy the herbage packs of hay but just the job to protect my gunnera - I would think! 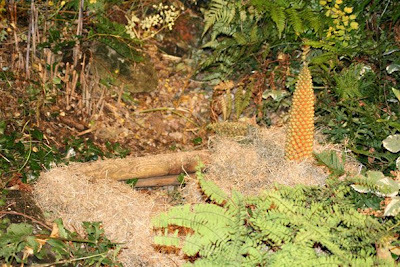 I see no reason why this wouldn’t work as hay/straw is used to protect the crowns of tree ferns which I would say would be a lot less hardy that my gunnera. 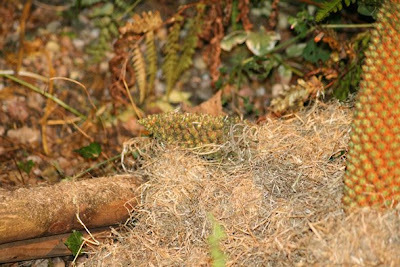 If anyone reading this has any experience of using hay to protect a gunnera and it hasn’t worked please do leave a comment here. This pack of hay went a long way as you can see above. One flower cone was on its side so I stuffed some hay underneath it to keep it off the ground. So this year, on cold dry ground, I gave a generous layer of hay before I put my first leaf through the flower spike to protect my plant. Next, I trimmed the stems from the gunnera leaves I had set aside and was ready to start stacking them. Turned upside down I just pushed the leaves through the flower spikes. You can see below I used the dried leaves collected from the garden in between layers. The layers are purely based only the number of gunnera leaves I have. I don’t use any damp or rotten leaves. These leaves of course don’t stay like this through winter – they do rot down eventually but, in my garden they have done the job of protecting the crown and so the plant. Just in case you haven’t noticed, I should point out perhaps that my plant isn’t growing in water. However, it is growing deliberately in a slight dip where water runs down and collects. I planted it on a large opened out compost bag which I pierced with holes so the water can stay damp most of the time. The basics of upturned gunnera leaves pierced through the flower spike I saw first on a video of Beth Chatto’s Garden. She has huge clumps of gunnera along a water’s edge in her garden. Most people are afraid their plant will get as huge and don’t try growing it but mine really has not outgrown its space – planted out of water! Ah… water in the garden at this time of year. Walking past my tiny pond I could see leaves had been landing on the duck weed on its surface - time for the fishing net and a plastic container. That done, I emptied the contents of the container beside a log pile I had made so any wildlife in it could find a new home. I enjoyed one last look at the water trickling down the rocks and the bubbles on the surface and went in to switch off the pump. 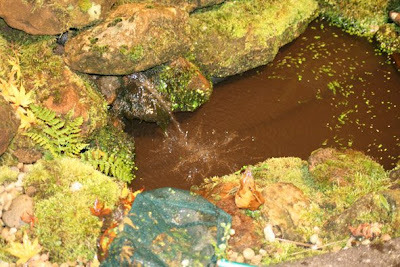 I know some gardeners may remove the pump completely especially when the pond isn’t deep like mine but I leave it where it is under a few logs which I placed near the surface deliberately to both hide it and to give birds a place to drink and frogs etc a way to get out of the water. 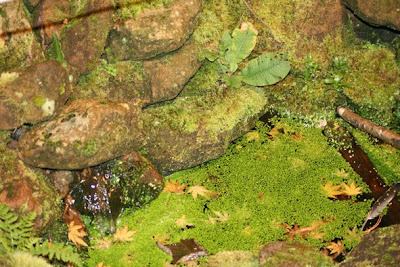 I wonder where the frogs go when it’s cold – perhaps in the caves I build especially for them? The feeding station I made especially for any passing hedgehogs I am delighted to say is being used. A dish of water as well as the peanuts (crushed in my food processor) is definitely a life saver for any hedgehogs (especially juveniles) that visit it at the moment as they need to build up weight to survive hibernation. A messy peanut dish in the morning is a sign they have been as I don’t always get sightings in the evenings even with my new wildlife camera showing a much bigger range in the garden. I’ll introduce this new camera soon. Of course, the hedgehog always appears when the cameras are switched off! Never mind a quiet rush outside with my still camera on a tripod and I did capture its visit at the end of my night of winter protecting the garden. 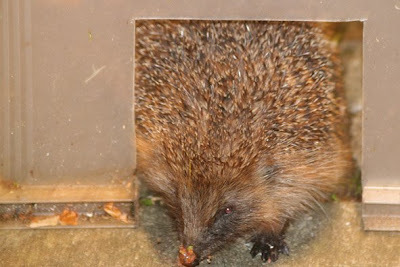 Note the peanut shell on the nose of the hedgehog as it leaves the box. 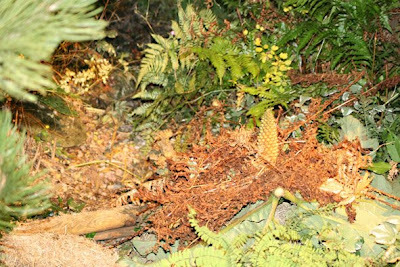 Ah… but I have a link here from the gunnera to the hedgehog! I wonder if anyone has spotted it. 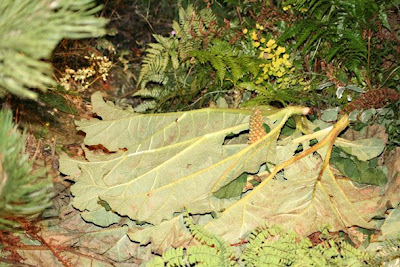 Since knowing I have hedgehogs visiting my garden I have wondered if they have ever considered hibernating under my protected gunnera. In spring I gingerly removed the old leaves but could see no sign. Mm… but this year there is hay there – I wonder if they will be tempted now. I will set up my camera in that area soon to see if I can see hedghogs pass through. The photos above were all taken in my garden on the evening of October 27th 2008. You are such a tease Shirl. I can't wait to see what you are stalking with your camera tonight. I love seeing the hedgehog. It looks almsot too fat to get through the opening of the box. I hope this means it will stay healthy this winter. My words exactly Lisa...she is a tease! Shirl, just put Hedgehog in any post title and I will be over here in a snap! Wondrful photo and how sweet he has the peanut shell on his nose! I'll be looking forward to seeing what you're up to Shirl! Your little hedgehog is such a cutie! Lisa – I am glad you enjoyed my videos. I love seeing the hedgehog too. Funny thing is when it hears me it can go into a ball or flat to the ground as in this case which makes it look fatter than it actually is. I hope all the ones in my area stay healthy too. I'm so glad i stumbled across ur page .. I'm not much of a gardener (well to be honest my garden is a mess) but i do have a large gunnera which i love! My mum bought it me to hopefully help with a very boggy corner in my garden.. and boy does it love it there! it was tiny when i got it and now 4 yrs on its huge! I remember reading to cover the bulb over in the winter with the leaves. Last yr i left it a little late and the leaves were un-usable so i used bin bags .. this year i have 3 large cones i didnt know what to do with them i was just about to cut them off along with the leaves ..thankfully i saw ur page 1st. Im gonna go out now and do as you have (i havent any hay but im hoping the dried dead grass will work as good) and hopefully my gunnera will come back as strong as it did last yr! Are the crowns those large (slimey) round bulbs in the ground? I now have 6 of these .. my Gunnerea has spread about a meter from the original spot i planted it in. Have you any tips on spliting it? My understanding is that the crowns are where the flower cones grow from. That’s why you protect the plant in this way.